9-1-1 Emergency Response Markers: Clay County Parks is excited to announce we are now part of the Mid-America Regional Council's (MARC) 9-1-1 Regional Public Safety Communications "Trial Mapping" project. The project utilizes GPS grid map coordinates that are assigned to "address signs" located along Clay County trails to assist 9-1-1 personnel and first responders in locating trail users during an emergency. Signs are located every 2/10 of a mile on the trails and a sign with instructions is located at every trailhead. Callers can locate the nearest sign and provide 9-1-1 with the seven character address with an exact location determined, 9-1-1 personnel can accurately dispatch first responders to the caller. Cabin Fever, Anita B. Gorman, Eagle's View, Smoke and Davey, Bonebender and Little Platte North Trail Signs have been completed. Little Platte South signs are expected to be completed by late spring or early summer. 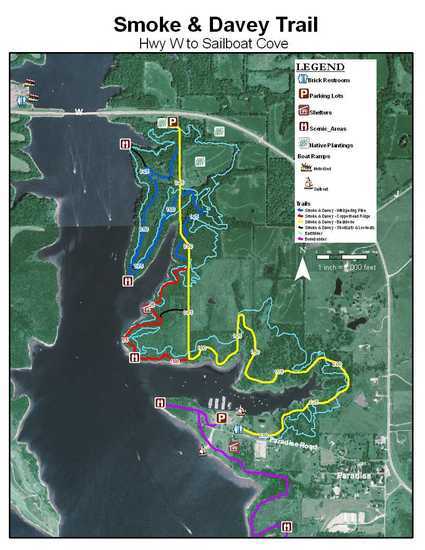 The trail system at Smithville Lake is currently composed of three types of trails: 24 miles of 10-foot wide asphalt walking/biking trails, 11 miles of single-track mountain biking trails, and 26 miles of equestrian trails. 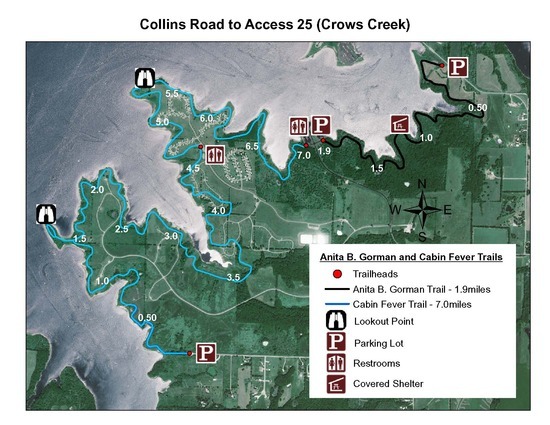 The Bonebender Trail System is composed of two trails and is 8.9 miles in length accessible from Sailboat Cove to the north and from the Main Park's Office to the south.